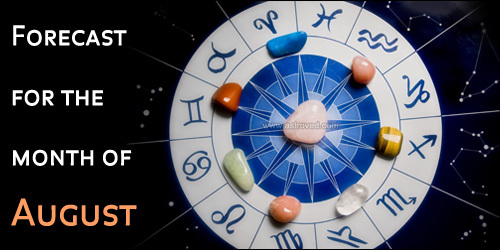 Following are predictions based on Moon sign or rashi for the month of August. Forecast is based on the movement of Planets in the sky. Moon sign is the sign in which the Moon was placed at the time of one`s birth. It would be a month of growth and progress. A new love relationship is bound to be formed. A good period for negotiations, business dealings, investments, buying and selling. Possible chances for new job ventures during the course of this month. Monetary prospects would be encouraging. Auspicious occasions at home would usher in harmony. It will not be an ideal month to hold auspicious events. Disturbances in personal relationship would bother you. Students will be able to do remarkably well this month. Small investments are advisable. During the first half of the month, you may face some hurdles in meeting your financial needs. Career related travel is possible. Not a favorable month for auspicious events related to relationship. Business dealings must be handled with care. A good month for undertaking major decisions. Plenty of opportunities would open up. Financial prospects will be good. New business contracts will be secured. A favorable month for career. However, you need to plan this month systematically. Auspicious events would take place, bringing happiness to you. Practice of yoga and meditation will help boost your health. The second half of the month would be better in terms of finance, marriage, business and career. This month, you would devise new plans and strategies for attaining betterment in various fronts. Marries couples would enjoy smooth and cordial relationship. It will be a month of hectic schedules and additional tasks. Avoid taking major decisions for the month. Auspicious functions like wedding should not be conducted during this period. Exercise caution in matters of finance. It is a good month in many aspects with plenty of opportunities for growth and happiness. Businessmen will earn good profits. New friends and associates will increase your social circles. Auspicious functions like weddings may take place in the family. Due to good planning and strategies, you will do well in your career. Business will expand and bring plenty of gains. It is not a good month for auspicious events. Health of elders needs attention. Students will show extraordinary development on all fronts. A favorable month to experience success in career. There would be good inflow of funds. Promotions, gains through speculation are possible. Smooth and cordial personal relationship would pave way to wedlock. Second half of the month seems favorable to conduct auspicious events. You may experience challenging situations with additional tasks at work front. Businessmen will experience stiff competition from their rivals. Focus on family well being would produce peace and harmony. Not a favorable month to conduct auspicious events.